I’ll be honest, I’ve gotten behind not only in posting, but also in my game in general. There were a few weeks I wasn’t able to play much AC:NL at all, and I don’t like to leave things to chance (like Melba moving out, or the most amazing item showing up when I’m not there to buy it), so I’ve been catching up through the days I missed by TTing. As I write this post I’m at around mid-September in my game, so that’s the extent of what this post covers. But I’m going to try to catch up to the present as soon as possible! I got my first jacob’s ladder, yay! 😀 But only one, and no golden can, because I was wanting to demolish some things and quickly lost PTS. Ah well, I’m sure I’ll get it again. I experimented with changing the motif on my mosiac paths. It’s usually just an abstract circular pattern, but here it looks more like a star/snowflake type thing. I wasn’t sure if I liked it better or not, so I reset without saving (so I wouldn’t have to re-do the path to how it was before). Any feedback/opinions? I proudly whipped out a balloon I recently got from a trader at an AC forum, and to my surprise, both Ryann and Jasper had balloons as well. 😛 I guess they aren’t rare, but I don’t really StreetPass, so balloons are still novel to me. Melba’s started making unexpected visits, so I guess my friendship level with her is getting high. Saharah gave me non-clashing carpet and wallpaper for once! I thought it might be fun to put together a Fall-themed room since I got the carpet and wallpaper from Saharah a while back, but I don’t think I have enough alpine furniture to really do it properly. I decided to use the fertilizer Kiki gave me with the blue roses Ryann gave me to see if I could grow another blue rose, and it worked! Ugh, what an unfortunate picture for an exciting gold badge. Finally got all the emotions! There were a fair amount of days it slipped my mind to get a new emotion, so it took me a little while. Katie and I brightening up a rainy day with the Flourish emotion! 🙂 I had to wait a pretty long time for this emotion, to the very last row. I loove his house exterior and think it fits well with the sunny color scheme on the fairytale-city side of town. And the interior of his house isn’t bad either, he seems to share similar tastes with Estel! In remodeling the train station and town hall, I’ve made a pretty big step in getting my town more the way I dreamed of it pre-game. 🙂 (The train station, believe it or not, I unlocked first. On a long car ride a while back, there was nothing better to do, so I just visited my own town over and over using my dad’s 3DS. 😛 ) I wonder what the origin for the town hall is, like if it’s supposed to resemble a Russian church, or just be a generic palace that might be found in a fairytale (hence the name)? I don’t know, but I like it a lot! This rock in front of the town hall — which has even made me consider resetting before — is still a nuisance and an eyesore, but after moving the path to the town hall farther down than it was before, I feel like I have more space to landscape and build PWPs without the rock majorly getting in the way. Posted on September 29, 2013 by Amy •	This entry was posted in AC:NL, AC:NL WiFi, Citalune and tagged Animal Crossing. Bookmark the permalink. my feedback for your path, well, I think a marble path with flowers on would match your theme more. I wasn’t looking to completely change my entire path quite yet; rather, I was wondering whether this or this is a better motif design for my current path. But thanks for sharing your thoughts! Step 3. It should take you to a page that looks like this. On the left, under “Available Widgets,” there are many grey rectangular boxes, each a certain type of widget for a different purpose. The most basic and versatile one is the plain “text widget,” but there are many other useful ones too. Drag the widgets you want to use for your blog over to the side of the page with the blue rectangular boxes, under “Sidebar.” You can also drag some of the blue rectangular boxes that are already there back to the grey boxes section; this will remove the widget from your sidebar. Step 4. Once you have all the widgets you want in your sidebar, you can start to edit them how you want to and write in them. Click on a rectangular box — representing a widget — to edit that widget, and then save your progress when you’re finished. You can also drag the blue rectangular boxes up and down along the Sidebar to change the order of the widgets. – Mayu’s WordPress hints page: this has lots of tips on useful HTML, which you can use to customize a basic text widget to make it whatever you want it to be. thank you, could you give me a link of what it looks like to you? The text i wrote in on the widgets has not appeared on mine. If you wrote in a new text widget and it didn’t appear on your blog, maybe it’s because you forgot to press the Save button? Just a guess. HeyIm on:-) ! Open your gate now!! I liked the star path ‘cos it looked more 3D. Plus, you focus a lot on stars and moons, so a sun would be kinda off-track, sorta like you play in the night, as Citálune was meant for. Everything looks perfect and in place, but there’s something bugging you and…it’s the sun in the path. Maybe star path wait crescent moon border would look better, and with different colours, maybe? I don’t know, both paths look fab! Oh, Colton is one of your dream neighbours? Lucky, I’ve only got one close to a dream neighbour. What type is he? You and Melba are, like, besties. But she hasn’t given you her picture! Bad Melba. Katie’s in your town so much, she’s like a little pet kitty. She wouldn’t make a bad neighbour, I guess. There aren’t any puppies or kittens, but there are bear cubs. I just re-read the thing on how you re-visited and re-visited your own town on your dad’s 3DS. I will do something similar when I feel like it! I love the driveway/pathway/road/whatever to Estel’s house! It has more of a ‘total queen’ aura than ‘mayor’! Thanks for the advice about the path! I do think I might give the star version of the path another try. Though that path is on the sunny, colorful side of town, and it’s actually the other side of town, where Estel’s castle is, that I’m trying to make look especially nice at nighttime (with lots of whites and cool colors). 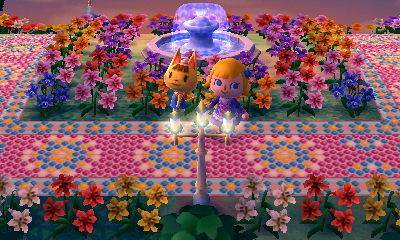 I just couldn’t bare having my whole town being laid out to look best at nighttime, I want some colorful hybrids and stuff too! xP So I like to think one side of town is the ‘city of the sun’ and the other side of town is the ‘city of moon,’ but ‘city of the sun and moon’ in probably any language would of course be too long for a town name. Colton is smug, so he’s one of those flirty ones 😛 It feels really good to have another dream neighbor! 😀 I hope you get some more of yours soon, good luck! I really do like your path! It looks like the Willy Wonka’s little sticker candies! I’m missing the alpine bed, closet, low table, and sofa, but I think the most painful one I’m missing is the large alpine table, since it’s perfect for a kitchen (so just ordering that would be fine). Thanks so much for the offer! Is there anything you’re looking for? Oh, I can get you the closet, sofa, and large table if you’d like? :3 Actually, I was wondering if you have any leftover Bug-Off furniture? No big deal if you don’t, I’m just missing a few pieces from it still. Heya, I was just looking at a strawberry pudding that reminded me of you, so… here I am, you know? Congrats on the new train station and town hall!! They look sooo lovely with the fairytale clock and lamps. Heehee good job having the perseverance to unlock the station that way 😛 I could never put my finger on what the town hall reminded me of; it looks like a cross of Russian church, the Taj Mahal and… fairytale-ness. It looks so dreamy all lit up just after 6pm. Same, it reminds me of all those things too. I learned that that style of dome is called an “onion dome” and it’s not only used in Russian architecture, although that’s what they’re most associated with. Thanks for the feedback and kind words about the path! 🙂 I see what you mean, with the star one I feel like I could have added in two more ‘points’ to the star if I had just a bit more room, so it does seem a little squished. I like that the star shape is sort of mirrored in the lilies lining the path, though. Ahh yeah, I’d love to have a fancier, more detailed and varied mosaic! In the future I’d like to try a mosaic-style path that isn’t just made up of circular stones, but a variety of differently shaped stones. Really? Happy labor day! 😛 So is Australia grouped with Europe as far as DLC and holidays go? I’ll give you a picnic basket the next time we WiFi, and hopefully we can WiFi soon one of these upcoming weekends or something. 🙂 As for the veggie basket, only if you have multiples, because I wouldn’t want to take an item of yours if it’s your only one. Don’t worry, you didn’t spoil anything, I’ve caught up past the Autumn Moon event. I’m on September 20th now, trying to get all caught up while I’m on Fall break! Haha, our Labor Day isn’t anywhere near as big as it is in America though (I think). Apparently we don’t even have a common date for it across all the states. Yep I got 3, so of course you can have one! Not just for AC:NL, but for the 3DS in general we’ve been grouped with Europe, and so far we have gotten all the same DLCs and holidays, which I’m pretty sure will continue. 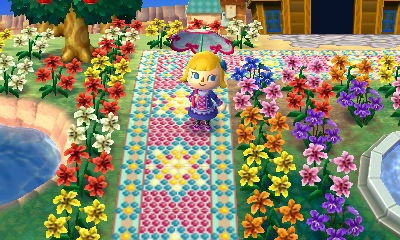 I love your new paths it matches very well with your hybrid flowers! 🙂 And the colour coordination from it it’s pretty awesome! 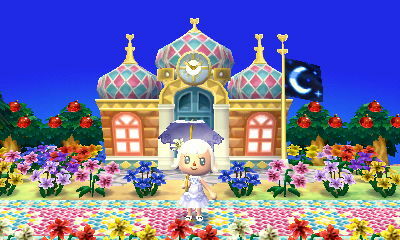 For a few days I bought me New Leaf, because it looks on your blog so awesome and I’m happy to see your city grow so fast, I also can copy a few of your ideas and don’t have to change my whole town! 🙂 And I really like your idea to create a fall-house/room. I really enjoy New Leaf but in the first week it’s a little bit boring, I guess. I don’t like it that I complete something and have always wait for the next day, but I think when I have unlocked more things, I have more fun. And I can’t wait no longer for my dream suit. 😀 I watch so much videos, and it looks so awesome, so yes, I will have an eye on Isabelle. 🙂 But when I got it your town will be my first dream. I think it will be a whole new experience to see your town in real and not only on photos. Oh and I think every town owner guess their town has too much imperfections, I know your town is unique and awesome with much work on it. I agree, it’s a reaally slow start. I remember just spending a lot of time fishing and bug catching for the museum at the beginning, since there wasn’t much else to do as the mayor. Hopefully the game’s pace will speed up sooner for you than it did for me (it took me a few months to feel like I was making decent progress).